Should I Buy Wood Windows or Vinyl Windows? Many people prefer the beautiful look of wood windows over vinyl, but today’s vinyl windows are more attractive than ever before. The Andersen Woodright window line remains a favorite among our customers, as it brings the beauty of the finest hardwood into the interior decor of homes. Generally, vinyl windows are less expensive than wood windows, making them a popular choice for those who are on a limited budget and need to have numerous windows or every window in their home replaced. 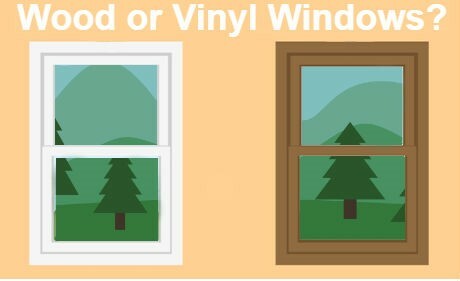 Both vinyl and wood windows can help to decrease utility costs when they are properly designed. New windows can eliminate gaps and cracks that allow air to enter and exit your home, and some windows on the market today have advanced features that increase their energy efficiency even more. Vinyl windows from the Simonton Generation Windows Collection are available with optional Low E/Argon-Filled glass. These windows reflect the ultraviolet energy and provide added insulation. As a result, less warm air escapes from homes during the cooler winter months, and homes stay noticeably cooler in the summer. Traditionally, wood windows were considered to be far more durable than their vinyl counterparts. This is because traditional vinyl frames expand and contract in response to temperature fluctuations and often deteriorate faster over time. However, the latest vinyl windows from Simonton address these problems with special sash construction and fusion-welded frames that are ultra strong and extruded lift rails that do not become loose with age. These windows come with a lifetime labor warranty and a transferable double lifetime product warranty due to their unparalleled durability. Generally, vinyl windows have larger frames and less glass than wood; however, for some people the difference is not much of a concern and may not even be that noticeable. High quality vinyl windows are virtually maintenance free, while traditional wood windows are more labor intensive. Traditional wood windows fade in the sun and require repainting to maintain their beauty and protect their materials. Andersen’s Woodright windows address this problem. While their interiors are solid wood, their exteriors are constructed out of a more weather-resistant composite that reduces maintenance needs. You may be surprised to know that there is actually a window that provides benefits of both vinyl and wood. The Andersen 100 Series windows are made from Fibrex, a blend of wood shavings, vinyl and proprietary materials. These windows are very strong and resistant to the elements, and we install them frequently in homes in the Austin, Houston and Dallas areas. Still not sure which type of replacement windows is right for your home? We’ll be glad to discuss the options with you and help you reach the right decision. Contact us today or complete our online request form for a free estimate.